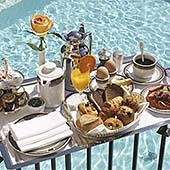 Hotel Byblos*****, St. Tropez, Riviera, France - GourmetVoyageurs.com. St. Tropez, Cote d'Azur, France. 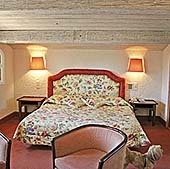 Hotel Byblos is as marvelous today as it was when we covered it 2005. 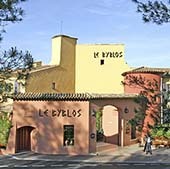 In, 2007, they launched a fabulous small and personal spa, "the Byblos Spa by Sisley Cosmetics" which makes it even more of a destination than it was before. They are doing this hand in hand with one of France's premiere beauty and cosmetic companies, Sisley, who manufacture an exceptional brand of spa products "Sisley", a perfect marriage of two small, French family owned companies that cater to a high end clientele. We return every year even if to only have our favorite lunch by the pool. If you are in the mood for a stellar dose of glamour, Hotel Byblos, in Saint Tropez, is the place to stay to see and be seen and just plain enjoy yourself in one of the best run hotels in the center of "chic", the south of France. Immaculately run with attention to the finest detail, with charm and comfort throughout, this is THE place to be when staying in St. Tropez famous or not. Located on one side by the park of the Citadel and on the other by the central market square, it is at once quiet and peaceful and on the other in the center of the action. Conceived in star dust, its whole history has been saturated in celebrity and "chic" not to mention glitter. In 1967, Bridget Bardot led the way in making this a celebrity hangout that endures to this day. It was here that rock star Mick Jagger and model Bianca Perez were married celebrating with Beluga caviar and hundreds of bottles of champagne. Out of respect to their privacy, we will refrain from naming all the celebs who call this spot "home away from home." But while we were there, our was the only room not reserved by the entire Lyons soccer team and families in town for a demonstration match with the local soccer team. It matters not whether you are a film star, however, or a guest wanting to play in this delightful village, the service and attention to your needs and desires remain the same. What we loved about our stay there was the genuine warmth and friendliness of the entire staff. This is not always the case in a hotel with a high celebrity count. The rooms and suites are all lovely decorated in the soft colors of Provence many overlooking the flowered covered terraces, passageways, hidden courtyards and the central pool. The soft Mediterranean color palette adorns the buildings that are grouped gracefully around the pool and continue to flow down the hill to arrive at the street below where the restaurant "Byblos Spoon" has morphed into "Rivea at Byblos" is set right on the corner of the large place where the weekly village market is held. The trendy but uncomfortable low couches on the deck are now back to being functional tables and chairs. And it is still run by Alain Ducasse so you can be assured of its top quality. The trendiest bar/club in Saint Tropez (if not all of the south of France) is also to be found at Byblos. “Les Caves du Roy” where the hippest people planet party into the wee hours and is accessible even to the non-celeb as long as you possess the right look. This hotel really was conceived as a Provençal seaside fishing hamlet and that theme permeates the buildings filling it with individual character and charm.. The buildings only date back to the mid 1960's but evoke the ages of an ancient collection of houses all nestled together. Each separate facade is painted a different color, the roof lines are at different levels and some are set in front of others. Many are arranged around courtyards, many have panorama views out over the town and over the bay. The pool area is almost like mini-harbor and the shopping is in a small enclosed "place" with old stone fountain, café table and chairs. Just down the outside staircase from the pool is the nightclub/disco Les Caves du Roy, probably the most famous on the coast. Total freedom from Paparazzi is ensured so no matter if you normally grace the glossy magazine covers or are totally unknown, you have the freedom to relax and have fun all night. So vacation, napping, soaking up the sun, being pampered in the Byblos Spa by Sisley Cosmetics >>, shopping, swimming, hiking, eating, sleeping, wearing a hole in the dance floor - whatever, St. Tropez is a great deal of fun anytime and Byblos adds that extra fillip of pleasure and luxury.